Paris will soon see a completely new hotel opening, exuding an aura of sensual elegance. 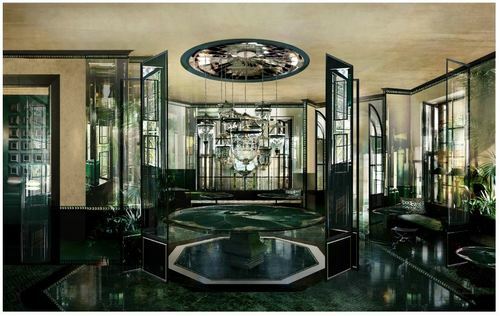 Designed around all the tones of dark green, it’s created by Anouska Hempel, and lies in the heart of the 6th arrondissement, where a part of rue Washington takes on the aura of a Moroccan oasis. Having worked in Istanbul for the last 5 years, on a palace on the Bosphorus, Anouska Hempel has taken the touches of her Arabic and Lebanese connections into a special mix of magical seduction. Lighting is soft and subdued, picking up the seductive atmosphere of the interiors.